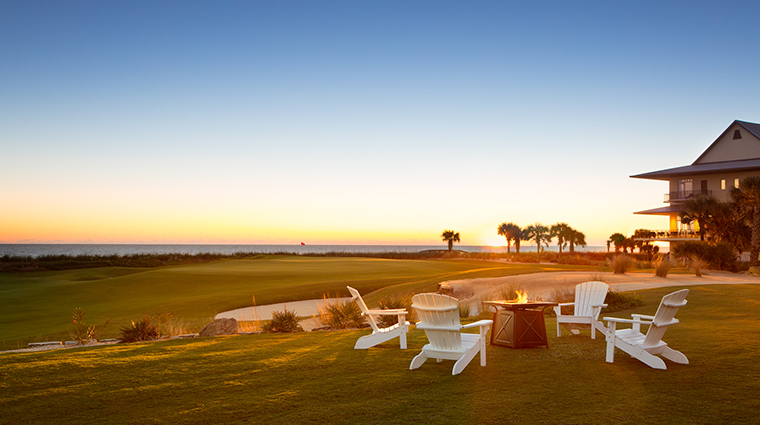 Hammock Beach Resort, located near St. Augustine and Amelia Island, features luxury villa and condominium accommodations overlooking the Atlantic Ocean, a 91,000-square-foot multi-level water park, signature golf courses designed by Jack Nicklaus and Tom Watson, a rejuvenating resort spa with influences from the sea and a host of other recreational amenities. 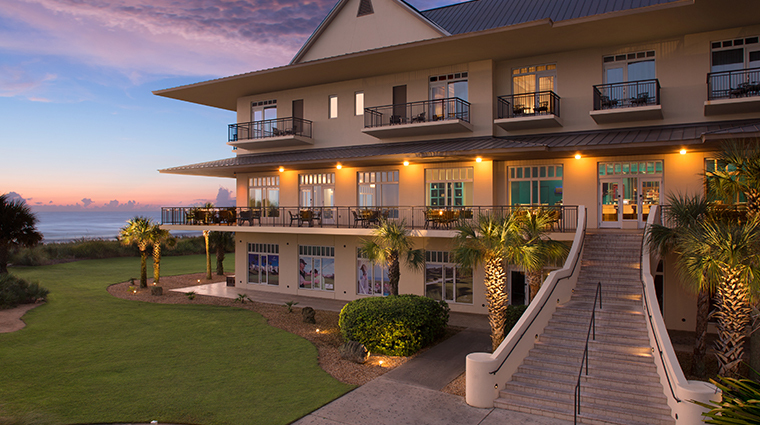 For golfers, the hotel offers the most oceanside holes on Florida’s east coast, and beachgoers will love watching the sand turn pink, thanks to the endless coquina shells that wash up ashore. The St. Augustine hotel is almost like an all-inclusive property; you’ll pay for food and drink, but the activities are all free. So go ahead and play as many rounds of mini-golf as you’d like, cool off at the onsite water park and partake in nightly events like dive-in movies without shelling out anything extra. 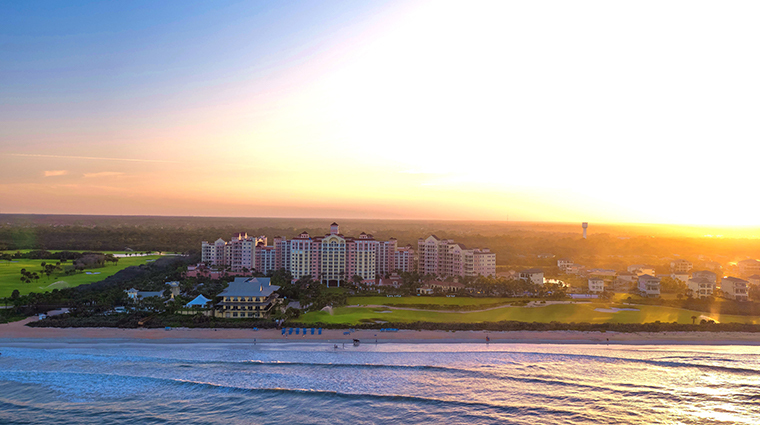 Located in northeastern Florida, just an hour south of Jacksonville and north of Daytona, Palm Coast is one of the Sunshine State’s hidden treasures—it’s one of the only beachfront resorts in the area. 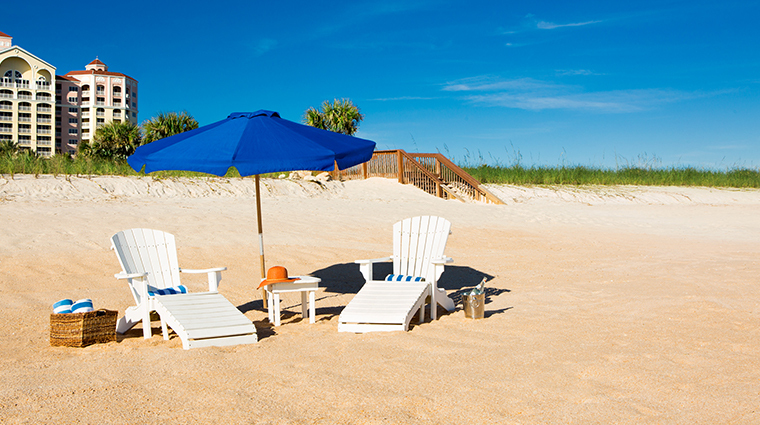 Hammock Beach Resort is set on a nature preserve in Palm Coast that is protected by the state of Florida. Head there to enjoy hikes through the marshes and along the beach. The resort’s water park has a lazy river, water slide and a water gym. Just above the water park is an adults-only pool and nearby is the “sand pool,” which uses sand from the beach to line the area instead of traditional concrete. 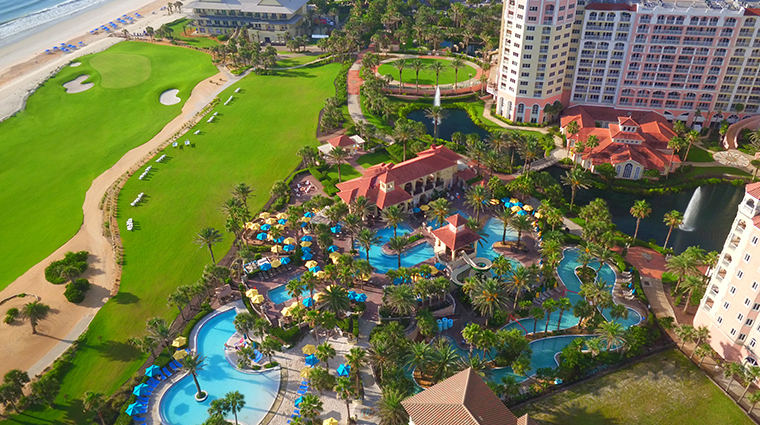 Hammock Beach Resort offers two professional golf courses (including the just-reopened Ocean Course) and one putting green course, which is perfect for young golfers or those who want to practice the short game. Hammock Beach Resort is a cashless hotel, meaning you don’t have to worry about tipping. Your room key works as a credit card during your stay, so anything you order will be charged directly to your room. The full-service spa at Hammock Beach Resort is a perfect little retreat — offering everything from massages to manicures — and the locker rooms have a sauna, steam room and eucalyptus inhalation room. Each room at Hammock Beach Resort comes with a coffee pot and coffee and tea filters. You can also venture into the lobby of the main towers for free freshly brewed coffee served throughout the day or specialty drinks, which are offered during the morning hours only. At Crown Jewel Cigar Bar, where you’ll find a selection of single malt Scotches, ports and cognacs, as well as a variety of cigars. Whether you choose to stay in the Main Tower, Ocean Towers or new-look Lodge, you’ll be able to take in the Atlantic Ocean (though some rooms just have partial views of the sea). The Main Tower and Ocean Towers rooms are available in one-, two-, or three-bedroom suites, with a separate living room, kitchen, and a separate dining room. Each room at Hammock Beach Resort comes with king- or queen-size beds, and some of the three-bedroom suites have rooms with two twin beds (perfect for kids). The guest rooms at Hammock Beach Resort are outfitted with basic technology: TVs, radios, kitchens (some rooms have just a mini-fridge) and Internet. Many of the suites at Hammock Beach Resort are owner-operated. That means you might be staying in an owner’s room, so the décor will be tailored to their taste. Mediterranean-inspired Delfinos is open for dinner on select evenings from 5:30 to 10 p.m. 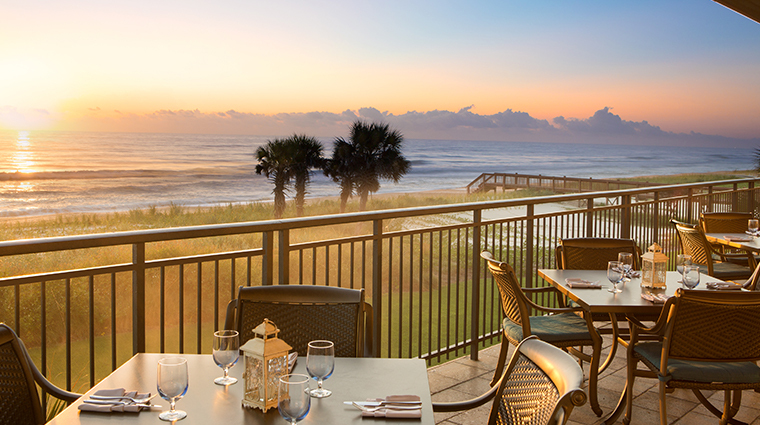 Located in the Lodge and the only oceanfront restaurant in Palm Coast, Atlantic Grille is where you’ll find breakfast, lunch and dinner daily. The fare here is simple seafood and American classics, including fish and chips, fresh grilled fish specialties and flat-bread pizzas. The Sushi Bar at Hammock Beach Resort is open for dinner only and located above Delfinos. The Sushi Bar serves traditional sushi rolls and sashimi. Fan favorites at poolside Ocean Bar & Grill include hot dogs, grilled burgers and fresh salads. You can dine here from 11 a.m. until dusk, weather permitting. Located directly across the way from Delfinos, Loggerheads Lounge serves bar bites and you’ll also find live entertainment at Loggerheads on Friday and Saturday nights.